Social media is a regular part of students’ lives. They use it to communicate with friends, share photos and post status updates on a regular basis. In fact, 92 percent of teens, ages 13-17, report going online daily. Unfortunately, this shift to more online communication has also brought more bullying into schools. Around 80 percent of young people believe that bullying is easier to do online and 43 percent of kids have experienced cyber-bullying, according to DoSomething.org. However, teachers don’t need to make students to put away their phones. Instead, teachers can use these tools in the learning process. Not only will this help make learning more relevant, but it’s also an opportunity to encourage positive social media use – something students don’t learn about enough. You don’t need to drop all the books and completely change course. Rather, bring social media into the classroom in small amounts, using projects or research as a chance to talk about positive and appropriate use of social media. Here are a few ways to make this work in your classroom. 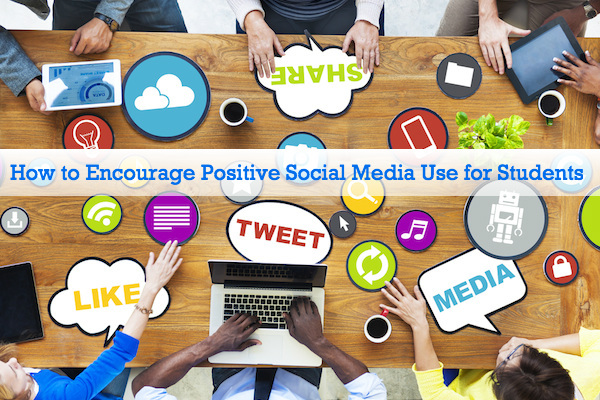 You don’t need to create social-media specific lessons to teach students how to use social media in a positive way. Simply bring these tools into your current lesson plans, giving them a chance to learn by doing. Use Twitter to Research: Show students that Twitter can be used for more than sharing their personal thoughts. Ask them to research and source at least three tweets for their next project. This will also give them a chance to practice deciphering between good and bad sources of information. Use Blogs for Work: Teach students that they can put their thoughts onto “paper” and share the final product with the world by bringing blogging into your classroom. Not only will they get a thrill from sharing the work they put so much time into, but this also gives them experience with using various blogging tools and writing web content; skills that are quickly becoming required of 21st century students. Students use Pinterest to share funny memes and products that they want to buy. But this tool—and others—can be used in so many different ways in the classroom. Use the following ideas to show students how multi-dimensional these social platforms are. Current Events Pinterest Boards: Each student creates their own board and adds a new current every week—or with whatever frequency you assign this task. Encourage students to go onto Pinterest and comment on their peers’ posts, allowing them to collaborate and socialize with an educational mindset. For most students, social media is used to chat with friends and share photos. With a classroom account, students can still do that, but within the framework of education and school. While you can use these groups to share homework, give test reminders, and further cultivate your classroom community, classroom social groups provide you with a great opportunity to encourage positive social media use. Create group rules: Every student must abide by the rules, including using appropriate language, proper spelling—you not u; your not ur—which may translate to their social media use outside of school. Create an anonymous concern form: Many students won’t report cyber-bullying for fear of someone finding out—90 percent of teens who have seen it say they ignored it. Provide students with a Google Form they can use to share any issues they’re having in the classroom group with regards to cyber-bullying or poor language use. While you should be constantly monitoring these platforms, students could write something and delete it before you see it. If you or your students aren’t ready to fully use social media in the classroom, use tools that have similar collaboration and social features. This gives you a chance to lay down ground rules and set expectations for social media use without allowing students to log into Facebook in the middle of class. Try one of these simple tools. Whooo’s Reading: Students call this tool “Facebook for reading,” because it incorporates many similar features of Facebook including commenting and “liking.” However, it also uses gamification features to motivate students to read more, while using fun CCSS-aligned comprehension questions to ensure they understand the text. Google Docs: Allow students to use Google Docs for peer reviewing. With this tool, they can collaborate and comment in real-time, similar to Facebook. Use this as a chance to talk about what makes an appropriate and helpful comment, versus one that is mean or inappropriate. Diigo: Students use this web platform to tag websites, create a personal library, share with classmates, and structure research. This puts an educational spin on sharing and online chatting, while allowing you to monitor and guide the process and conversation. Bringing social media into your classroom isn’t just about engagement, or giving students what they want, it can be beneficial in teaching how to use these platforms correctly. With cyber-bullying and teen social media use at an all-time high, teachers have an opportunity to change the course. Jessica Sanders is the Director of Social Outreach for Learn2Earn, a San Diego-based education organization that offers Read-A-Thon fundraisers and reading motivation tools for teachers and schools. She grew up reading books like The Giver and Holes, and is passionate about making reading as exciting for young kids today as it has always been for her. Follow Learn2Earn on Twitter and Facebook, and check out their new ebook, How to Bring Technology Into the Classroom, just $2.99 on Amazon.com.